As soon as my feet hit the ground in Mexico, I have a panic attack. Curled up on top of my suitcase in the bathroom of the baggage claim, gasping for air, it takes me a long time to realize the urgent female voices I hear are talking to me. When I was 12, my friend went to England. I have wanted to go to London terribly, my whole life. The day she traveled, I stayed up until 3AM so she could call me from Heathrow just so I could hear the air over there. She held up the phone for me so I could hear the sounds of the airport. I was too excited to go back to sleep after. I still haven’t gone to London. I’ve google searched my way to a beautiful restaurant in downtown Calgary. I am by myself. They sit me at the bar, between two couples that have their backs turned to me and keep elbowing me unknowingly. I am served the best pasta I’ve ever had. I tell the bartender who is serving me that it’s fantastic. He can’t hear me over the sound of the martini shaker, and I’m too shy to repeat myself. I think about taking a picture of my plate, but it’s too dark and it doesn’t look like much of anything anyway. I’m sitting alone, drinking a glass of white wine at an airport bar, conveniently located immediately facing the gate of my delayed flight. I have my sunglasses, wallet and passport on the table in front of me. The television is broadcasting updates on the Nigerian school girls, abducted from their towns. I put my passport into my jacket pocket and zip it closed. As she leans over the kitchen counter at her home in East Van, my mom tells me that my abuelo used to drive every day from their home in El Paso to go work in Juarez, just on the other side of the US/Mexico border. Two days later, I board a flight, YVR to LAX that my dad must have done hundreds of times. Work, home. Trabajo, hogar. On our day off, we drive to the East LA apartment building where I grew up. I haven’t been here since I was 4 years old. Tentatively, we walk through the apartment compound and find the one that was ours – I don’t want to intrude on the current tenant’s privacy, so I take a picture of the outside of the building and we head out. Through a fence, I see a pool and memory shocks me like jumping into cool water. I only ever had one fuzzy memory of LA, and I’m suddenly looking right at it. In LA I see fellow Chicanos evaluate me, choosing English over Spanish so I understand. Fair enough. I try not to take it personally. On the first day of the festival, the facilitator asks us to imagine the stage as a map of the world, placing LA, Central America, Australia, China for reference. “Go to the place you call home,” she says. Hundreds of us go down to the stage, and it’s so densely packed that it’s impossible to tell where I’m standing. After almost two years of frequent visiting, I finally have a dream about Toronto. I’m headed west along King Street, waiting to get off at Spadina so I can take the streetcar up towards Bloor. The dream is accurate and unremarkable. Sometimes I can have a conversation in Spanish and it’s no problem. Sometimes, the words tangle up in my mouth and shame locks up every syllable. Often the person I’m trying to greet will switch languages. If they can’t, I apologize in any language I can muster, smile, and leave as quickly as I can. And sometimes with a good new friend the conversation flows freely, dancing easily back and forth across the invisible fronteras of language, meeting one another where we can make ourselves understood. Whenever I arrive somewhere new, I have a routine. I open the window, if I can. Put lavender oil on the bedspread. Turn on the lamps and turn off the overhead lighting. Open my phone and start my white noise app. I will try to text someone at home, but the time zones almost never work out. We’re in Puerto Morelos, a small beach town hidden between two major tourist centres on the Yucutan Peninsula. We’re sitting at a plastic picnic table outside and I’m chatting with the restaurant’s server and chef en Español, while my boyfriend holds my hand and looks over my shoulder at the stray dogs playing on the sidewalk. For the first time in months, I can breathe. My heart feels like a raincloud, heavy and full. Me, 8:56 PM: I’m really, really ready to come home. The last day before leaving is always strange. Permeated with an urgent finality, the place appears to me vivid, iconic, crystalizing into instant memory. The past leaps up to meet my foot with every step, bending time zones and timelines to create a dizzying déjà vu of alternate lives. “You were always here,” some part of me says. “Where do think you’re going now?” I look at my watch, check in for my flight exactly 24 hours before. Get on my hands and knees and feel under the hotel bed to make sure nothing is left behind. On his million trips there and back, my dad would often bring me a present. I try not to accumulate too much stuff, though. I have to carry my home with me. It’s 8am on Commercial Drive and I’m walking to the community centre when I realize halfway there that it’s Labour Day, and the pool will be closed. That’s fine. This becomes a morning walk instead. It’s uncharacteristically quiet, except for the hiss of the number 20 and some restaurant prep cooks blasting music so loud you can hear it from the street. I grew up on the Drive, and there’s no place in the world that feels as much like home. This was the neighborhood we landed when my family moved North from Rodney King-era East LA – away from the highways and riots and tucked into the quiet greenery of East 3rd Avenue. I’m at the age now where if I close my eyes, I can tell you what things used to be as easily as I can tell you what they are now. I remember the little Vietnamese bakery where my friend and I used to buy 69 cent spring rolls, burning our fingers and tongues to eat them before they soaked through the paper bag they were delivered in – gone. I remember playing foosball at Joe’s Café with my friend and our dads, screaming ourselves hoarse and getting calluses on our palms from the cracked handles of the table – still there. I remember the exact moment, as a young teenager, that I walked past Café Roma and realized the men were looking at me in that way – still there, but different than I remember. And even now, the smell of chlorine, chocolate milk, and white chocolate raspberry scones are inextricably linked by years of afternoons at the pool for swimming lessons followed by a trip to Uprising Bakery. I am becoming a regular again at that same pool, swimming laps under the watchful eye of the tiger mural, unchanged from when I learned to swim two decades ago. This is a community born from resistance. Early in the twentieth century, speculation failed here. The neighbourhoods instead filled with immigrants from Italy, Portugal, and later Vietnam, Latin America, and beyond. The sidewalks hum with banter in more languages than I can count. Next to posters of Fringe shows and big-name concert are pasted posters announcing protests, anti-oppression workshops, political actions. I remember the year that a Subway opened up (near Charles, if I remember correctly,) and I remember it shutting down, no competition for the real Italian subs available just across the street. But the chains are coming and staying now, each two-year-lifespan gastropub replaced by another one. The co-ops and subsidized housing that my classmates grew up in are threatened by the arrival of new and shiny condos. Gentrification. Inevitable – and yet to me, inconceivable in this scrappy corner of our increasingly homogenous city. I now live two blocks down from the house I grew up in, the one my family was renovicted from when I was a child. Sometimes I wonder if I am now part of the problem. But when I get a notice of a rent increase and my heart squeezes so tight time stops, when my roommate and I get our taxes back and fall to the floor laughing because we fall so far below the poverty line, I think no, not me. Then I look at the low-income housing across the street, and wonder if they’ve stopped laughing about it. One night, as I lay in bed, I heard shouting in the street. First, the familiar intonations of a regular who walks the length of the Drive with his little dog, singing and speaking to himself. Second, the clicking of high heels and the cruel millennial bleat of a woman following him, mocking him, drunk and mean. Rage stiffened my body as I prepared to hit the streets and intervene, because some resistance comes with its fists up. And then: the man’s terrifying roar, then silence: the sound of heels clicking quietly away. This neighborhood knows how to defend itself. In the chilly morning air, I walk past the primary school where my mom helped our neighbor with 6 adopted and foster children walk to school, where my teacher first taught me to write my own books; I walk past the elementary school that collected giftcards and donations to help my family when our house burned down; I walk past the swimming pool where an instructor taught me to resist the urge to panic when I put my face underwater; I walk past a person sleeping on the street; I walk past a steel and glass storefront selling $80 throw pillows; I walk past an elderly woman in a track jacket going for a run; I walk past an old man smoking on the patio of the Italian coffee shop; I walk past a pile of wet abandoned clothes in the park; I walk past the spot where yesterday I ate tamales outside and listened to a man sing in Spanish, my heart quivering with blood memory; I walk past stores and homes that are, that were, and that will be. This is what we’re fighting for. The unbelievable complexity of co-existence on this Coast Salish land that was never ours to begin with. Deeply imperfect, but essential all the same. With every force that seeks to make us fear the other and each other, to guard our resources, to get what’s ‘ours’, we resist. We fight for community centres and rent control, for our schools and shops. We fight oppression in all its forms. We are not all the same. We are not all fighting the same fight. But resistance lives in the met eyes of neighbors, in ‘good mornings’ and ‘do you need help?’ It lives in hot coffees for strangers and signed petitions, in your feet on the ground at protests and rallies, in solidarity. In the quiet streets of the Drive on Labour Day. I’ve just returned from an incredible week at The Banff Centre as part of the 2016 Playwrights Colony. I was there with my collaborator Molly MacKinnon working on a new piece titled Never The Last, which premiers next month at the rEvolver Festival. I was so grateful to meet some brilliant minds from across Canada, and to enjoy the facilities at Banff. Molly and I worked round the clock to turn out two new drafts in one week – the result will be on stage just three weeks from now! Another nice thing: I am in great company as one of six finalists for this year’s RBC Tarragon Emerging Playwrights Prize. You can read more about the other amazing finalists here. It feels like a really wonderful time to be a playwright in Canada – I’m filled with gratitude. I also just literally got home from Banff, so I’m going to bed. Goodnight, friends. On Monday night at the Jessie Richardson Theatre Awards, I was honoured to received the Sydney Risk Prize for Outstanding Script by an Emerging Playwright for Selfie. 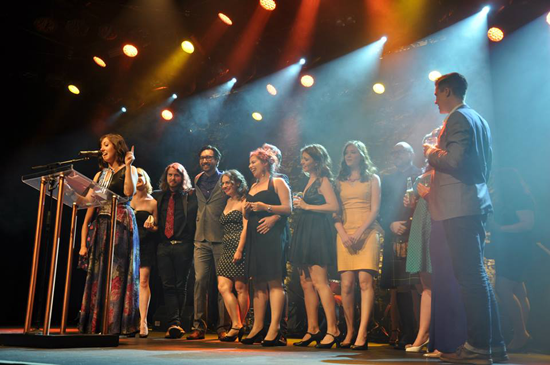 I also got to get up on stage with my very best friends in the world to accept the Jessie for Outstanding Musical – Small Theatre for Stationary: A Recession-Era Musical. Awards are weird and wonderful (and then weird again). In an industry where merit and success so rarely meet, it’s a bit odd to take one night a year to declare a winner. 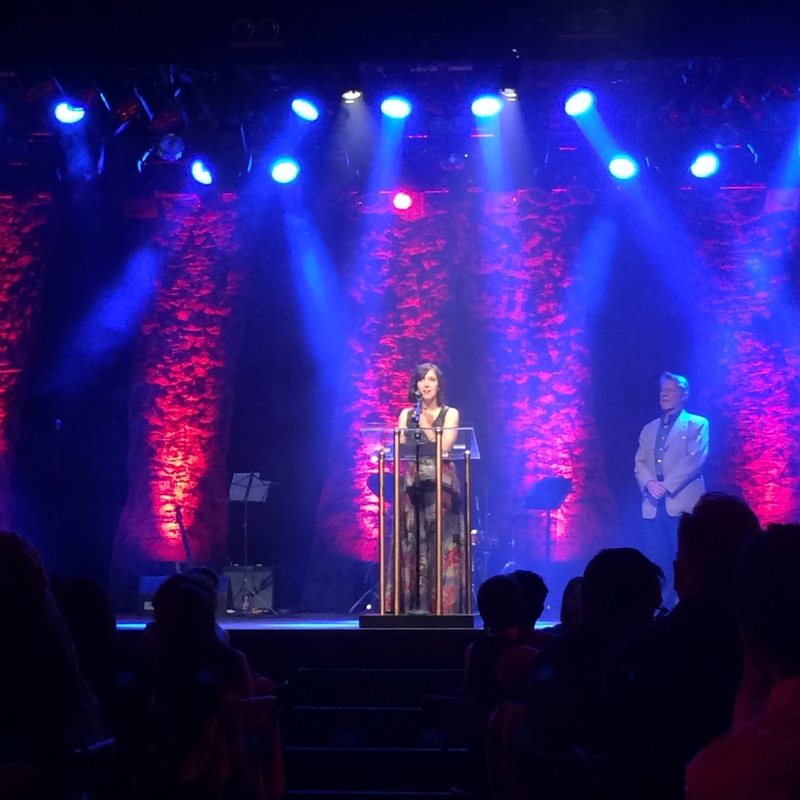 But I think the real impulse is to celebrate and to come together – to recognize the hard work and to (try to) get all our beautiful, vibrant colleagues in one room to say, as Dawn Petten so beautifully put in her acceptance speech, that this is ‘our town’. One of my favourite phrases is ‘a rising tide lifts all boats’. I believe this, absolutely. It’s the guiding principle of everything I do in the theatre. When we are at our best, we all win. And this experience has reminded me that I have been lifted by the people in this community – I am the beneficiary of programs and people who made room for me at the table. Sometimes as artists we live in a culture of scarcity that can trick us into thinking we can’t afford to lift everyone up, when in fact the truth is that we can’t afford to leave anyone behind. That night reminded me of the incredible generosity I’ve been shown in my short time in the professional world, and I intend to pass that kindness on to anyone I can. Win or lose, feast or famine, it won’t always be this good – so when the tides rise and we cast our nets, the bounty will be so much greater for having everyone on board.